You can also take a look at the entire collection. It has a series of products for your home as well! 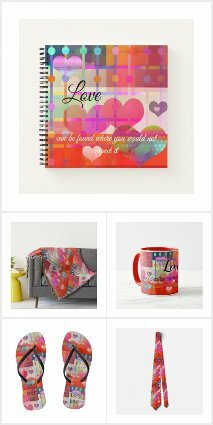 The designs are created in a tiled version, so you can scale or rotate them in the design tool on Zazzle. I’ve already set up shapes to add your custom monogram, but you can also rotate, scale or delete these or play with some other options. You may also like to check out a previous post with messenger bags or take a look at the messenger bag product page. This first design shows a filigree fractal pattern. This sleeve offers the option of added texts and custom shapes. The second design is an image of dunes overlooking a beach and ocean … for beach lovers! And a striped design with your own custom background color. And the last one with a lovely wavy teal blue green striped pattern laptop sleeve with your custom monogram. These scarves are available in different sizes and shapes and also make a great gift for Mother’s Day! There are light and transparent, so that you can see the design from both sides. You may also like a previous post with scarves. I’ve added a new product: clutches! Both elegant and useful, these clutches are great to treat yourself or as a gift for someone else. Fold-over clutch with a colorful plaid pattern and your own monogram or text (optional). This eye-catcher will attract some conversation 🙂 Of course you can also add your own image to personalize even more! You can customize the texts!